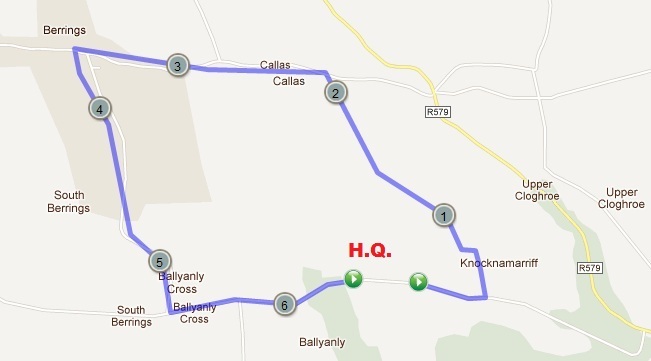 Munster Snr & Novice Roads, Ballyanly, 11-Mar-2012, 1pm — St. Finbarr's A.C. The Munster Senior & Novice Roads Championships 2012 take place on Sunday 11th March 2012 at 1pm in Inniscarra, Co. Cork. Race H.Q. for the day will be the Inniscarra Community Centre in Ballyanly. The race will take the same route as the traditional Inniscarra 4M Road Race. This is an AAI event, so participants will be required to wear a Club top. Athletes representing Cork will receive their singlets on the day. The first six finishers score in the men’s event and the first four in the women’s. From Cork City and its suburbs, head out west on the N22 Carrigrohane (Straight) Road. At the traffic island, turn right following signs for Kanturk R579. Having passed the Anglers Rest Pub take the road straight ahead for Kanturk R579. Follow the road for 4.7M passing through Cloghroe village until you reach Blairs Inn pub on your left hand side. Turn left at Blairs Inn and continue up the hill for 1M mile until you arrive at Inniscarra Community Centre in Ballyanly. The first two thirds of the race feature a substantial climb of about 60m – that hill in Ballycotton last Sunday was less than 20m. The final third is a long, fast descent to the finish. Good luck all!